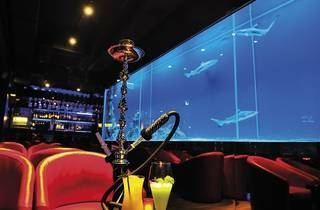 There’s no shortage of Hong Kong bars which tout shisha on the menu. If you want to smoke the sweet stuff there’s plenty of places to shell out a few dollars on an elegant hookah (yes, that’s ‘hookah’, the waterpipe, we’re not talking Wan Chai at midnight here…). But most of these bars are loud, jam-packed and focus more on the booze than the sheesh. Not so at Bloop. This lounge is all about the smoke – and it’s the perfect, tranquil space to enjoy it in. Perched on the 21st floor of Lan Kwai Fong’s Ho Lee Commercial Building, the premium shisha spot screams style and class. With a shark tank running down the middle of the space and a balcony overlooking a splendid Central vista, it’s refined, modern and so laidback it could be horizontal. We grace the venue on its opening night to the public (after popping in a few days earlier and being kindly given an impromptu tour despite our premature visit). Normally we wouldn’t be so unfair as to review a bar until it’s had a few days to get into the swing of things – but we’re so eager to fill our lungs, we reckon 'what the hell'. And Bloop has nothing to complain about. Despite members of staff saying there are a few problems to iron out, we can’t spot them. We take our place on the balcony while admiring the spectacular view, with one eye on the shark tank inside. There are three blacktip reef sharks in the eight-metre aquarium at the mo after one got scared, we’re told, a night before the public opening. 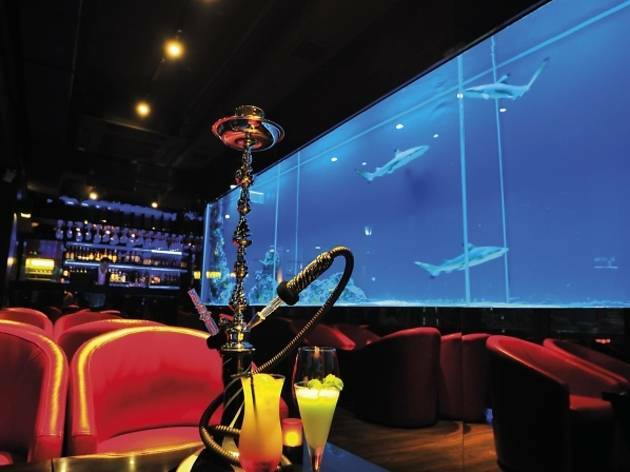 The fish – which we name Nibble, Bite and Munch – are joined by a stingray, creating an underwater scene which you just get lost in (particularly as the cocktails sink their teeth in and the shisha creates its purple haze). We’re in the mood for a cocktail or three so we try the Mexican Mule, which has a vicious kick, the Cactus Jack, with its prickly finish, and the Jamaican Sunset (all $60 at happy hour), which brings us out in smiles. Each tipple has a bite worthy of the sharks themselves. Also check out the wines and spirits on the menu. But it’s the shisha we’ve trawled across town for. Against a backdrop of acid jazz, we fork out a cool $275 on a brand new hookah pipe and opt for the bizarre-sounding UFO flavour from the list. And, true to form, the taste is alien (maybe bubblegum, blueberry and, um, soap?) but it’s a fantastic smoke and really puts us at our ease. We could spend an eternity puffing on a pipe and languishing here. 21/F, Ho Lee Commercial Bldg, 38-44 D’Aguilar St, Central; 2686 1234.